In times when energy is becoming ever more scarce and more expensive, and when using energy efficiently is becoming a key topic in both the commercial and public sectors, smart measures to reduce consumption and cost are high priorities. That was the case in the Baden-Württemberg district of Biberach. The district, which has 45 cities and boroughs, does already cover 31 percent of heat consumption with renewable energy and another 19 percent with so-called replacement measures in the district school and administrative buildings. However, the borough council made it their mission to continue consistently taking advantage of opportunities to generate energy efficiency and energy savings. The project managers felt establishing software-supported facility management would be a key instrument for helping them achieve their goal. In addition to handling all tasks related to property management, energy controlling and preparing an energy report were two other requirements for implementing energy management. They decided to work with facility management by Axians Infoma. One reason for their choice was that the process includes all features and requirements needed to achieve the goals the district administration had set for themselves. Second, the borough council Financial Accounting department was already using Infoma newsystem financial accounting from the Ulm provider. The integration capabilities offered by the solution let the district avoid unnecessary interface connections and having to maintain different software products – a key criteria in their decision. To achieve efficient and effective energy management, it is important to identify potential energy savings and use this information to derive appropriate measures. In the local government sector, which has to deal with a wide variety of different buildings and types of use, transparency is extremely important. Only a good basis of information, made up of updated and transparent data, can give project managers a comprehensive overview of the complex technical interactions at play, and facilitate an objective analysis. This is why one of the first things Biberach decided to do was create an energy report. It is prepared annually in order to present the development of consumption within the district’s own buildings. 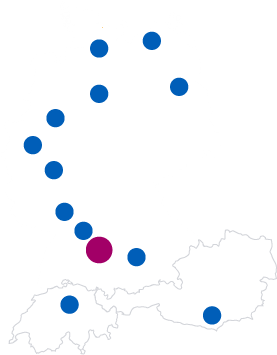 The 190,000 inhabitant district uses the standard Baden-Württemberg energy report to compare its performance with other local governments, although it did have to make some adjustments to local considerations with the help of Axians Infoma as a pilot user. The graphic representation was adjusted, for instance. Various functions in the energy management module employed by the district allow them to automatically create the energy report for administrative and school buildings. Meters, measurement groups, consumption areas, and utilization units can be defined and managed in the consumption record. Meter replacements and overflows can be documented, and energy consumption and consumption costs for the individual properties can be displayed. Consumption, cost, and pollutant developments are also illustrated. By creating key figures and then evaluating them based on energy consumption and costs for comparable buildings, the district can then identify areas of potential savings. The energy report presents this data on developments in the district’s own buildings to supervisory boards and the public alike. However, it also shows the effects of the energy measures they are implementing, and which buildings still need energy improvements. Even though retroactive collection of energy consumption and cost data for each of the 44 buildings managed by the district represented a large amount of work, the benefits of energy management are very clear. Since energy consumption is recorded along with energy costs from incoming invoices, updated consumption values are available at all times. In addition, construction and other measures can be broken down better, making cost controlling simpler and faster for each and every property. After using the system for two years, project managers at the borough council give it a positive rating. However, as pilot users of the system they do have suggestions for ongoing developments within the module. One finding that has resulted from practical use is that the mix of energy used in the individual buildings, such as from cogeneration plants, is not clearly depicted. In addition, Biberach is also interested in subdividing figures for individual years to reflect buildings which have been expanded through additional construction. In the near future, the district intends to use the software even more intensively, and to use all of the opportunities available to it as well as possible – especially in terms of cost monitoring, evaluation, and reporting. Furthermore, they are also considering introducing our cleaning management module in the next two years. Smart ways to reduce costs and consumption are a high priority for the Biberach borough council. Double-entry financial accounting by Infoma newsystem, facility management since 2011 with the basic module incl. contract management and equipment, measure management, energy management.